[Matt Kane] works at a really cool company in the UK where he recently finished working on the Triggertrap Ada — the highest-performance, most feature packed camera trigger out there. So just for fun, he decided to challenge himself again — could he make a super basic, super fast, bare-bones camera trigger for $2 instead? At the most basic level this is just a laser pointer and a light sensor. When the object your photographing breaks the light path, the flash triggers. Typically this is done with an IR laser, but since he’s going for a low-cost system, he’ll use a basic 1mw red laser pointer — the only downfall is you might see it in the picture. Let’s go back in time to the 1980’s, when shoulder pads were in vogue and the flux capacitor was first invented. New apartment housing was being built in [Vince’s] neighborhood, and he wanted some time-lapse footage of the construction. He had recently inherited an Elmo Super-8mm film camera that featured a remote control port and a speed selector. [Vince] figured he might be able to build his own intervalometer get some time-lapse footage of the construction. He was right. An intervalometer is a device which counts intervals of time. These are commonly used in photography for taking time-lapse photos. You can configure the intervalometer to take a photo every few seconds, minutes, hours, etc. This photographic technique is great when you want see changes in a process that would normally be very subtle to the human eye. In this case, construction. [Vince] started out by building his own remote control switch for the camera. A simple paddle-style momentary micro switch worked perfectly. After configuring the camera speed setting to “1”, he found that by pressing the remote button he could capture one single frame. Now all he needed was a way to press the button automatically every so often. Being mechanically minded, [Vince] opted to build a mechanical solution rather than an electronic circuit. He first purchased a grandfather clock mechanism that had the biggest motor he could find. He then purchased a flange that allowed him to mount a custom-made wooden disk to the end of the minute hand’s axle. This resulted in a wheel that would spin exactly once per hour. When [Abhimanyu Kumar] noticed money going missing from his small bookshop, he decided to set up a little trap to catch the thief. The problem was that the bookshop’s money was stored inside a cupboard in their house (back end of the shop), which meant that the culprit was likely one of their own employees. They already have a CCTV system installed in the actual store, and although he could simply add another camera in the house, [Abhimanyu] didn’t really want to do that. He instead devised a simple security trap: dubbed the Jugaad Security System. In Hindi, Jugaad quite literally means “hack”. He added a small magnetic reed switch to the cupboard where the money is stored—well, was stored—which is then linked directly to an intervalometer. This then connects to an inconspicuous DSLR sitting on one of the work benches. He aimed the camera at the cupboard and, in case the lights are out when the system is tripped, set it to an extremely high ISO. 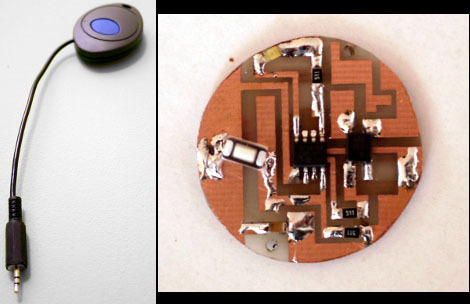 This project started as a simple microcontroller replacement on this IR camera remote control PCB. But the soldering job went rather badly for [Balthamos] so he changed things up and designed his own simple AVR remote shutter release and intervalometer. The DIP chip seen with most of its legs bent backwards is the ATtiny25 which makes the system work. It’s patched into the traces for the battery connections, button (on the other side of the board) and the IR LED he’s pinching with his left hand. Point it at a Cannon camera and push the button to snap a photo. But as you can see in the clip after the break it also serves as an intervalometer; letting him take several pictures with a user-defined pause between each. That mode is selected by first pressing and holding the button. Once released the chip waits for a second button press to register the delay. The new circuit still fits in the original case after just a bit of alteration to it. That finished look for your project is all about the enclosure you find to host it. We think [Punge] really did a great job with the case for this DIY intervalometer. The build section of the project page links to the company that makes the enclosures. They’re meant to host round PCBs with several options for button configuration. Combine this with enough space for a coin cell and you’ve got a great looking custom device. The intervalometer itself is much like others we’ve seen. It uses an audio-jack connector to control the camera. You have the option of using a three or four contact version depending on what your camera supports. The PIC 12F683 uses an optocoupler with a built-in transistor to do the switching. A single button seen at nine o’clock on the board above is all it takes to start the device off. Press and hold once to wake it up, then wait for your desired interval and press the button again to start the timed shots. You’ll notice that there is no programming head in this design. A separate board was etched to attach the PicKit, with the surface mount chip just held in place during programming.